Real Madrid secured an historic 10th European title as they came from behind to secure a thrilling 4-1 win over Atletico Madrid in Lisbon on Saturday. Diego Godin capitalised on a dreadful error from Iker Casillas to head home shortly before the end of the first half, but Ramos powered home from a corner in the dying minutes of normal time to keep Madrid's Decima dream alive. 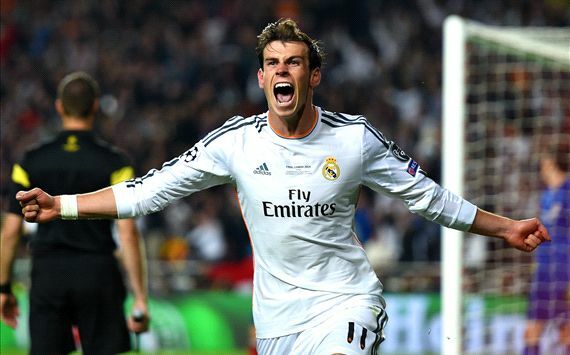 With less than 10 minutes remaining in additional time, Bale headed into the top corner after Angel Di Maria's shot was saved by Thibaut Courtois before Marcelo buried a late left-footed strike and Cristiano Ronaldo scored a penalty to seal Madrid's first Champions League trophy since 2002. Victory means Ancelotti has now won Europe's top prize as coach on three occasions, making him the most successful in the modern tournament's history, while Atletico were left to rue another late goal in European football's showpiece. The club's only other final appearance, in 1974, saw Bayern Munich force a replay ? which they won 4-0 - with a 120th-minute goal. Much of the pre-match talk surrounded the fitness of stars Ronaldo and Diego Costa, but both started, although Arda Turan was not so lucky and missed out with a knee problem. Simeone's experiment to start Costa ? who travelled to Serbia for specialist treatment on a niggling hamstring injury in the build-up ? quickly backfired, though, as the striker limped off in the ninth minute and was replaced by Adrian Lopez. Chances were few and far between in a cagey first 30 minutes before a sloppy Tiago error saw the contest come to life, with the midfielder conceding possession in his own half, only for Bale, after a menacing run, to shoot wide. And Bale's missed chance proved costly in the 36th minute as Godin gave Atletico the lead against the run of play. Real failed to clear a corner and Juanfran's header back into the box caught them napping, meaning goalkeeper Casillas had to come storming off his line. He was too late to win the ball, though, and agonisingly saw Godin beat Sami Khedira and put a looping header over him and, eventually, over the line. Thibaut Courtois had to be alert to tip over a deflected Ronaldo free kick in the 54th minute and the Real talisman spurned two more opportunities in the next 60 seconds, firing a snapshot wide before producing a wayward header.